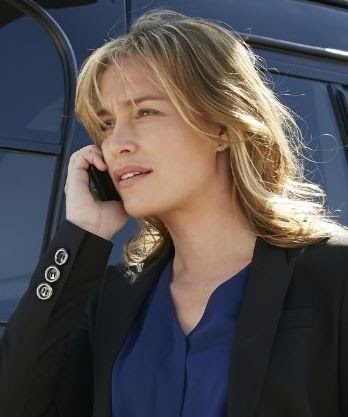 USA's Covert Affairs returns to the network for its fifth season, starting June 24th. And the events of the previous season were pretty impressive. Impressive in how they reinvented the story of Annie (Piper Perabo) and turned it all around. It was a great change and approach to keeping the show fresh for viewers. Season four of Covert Affairs was the season of Annie Walker needing to go dark and playing a rogue agent chasing down the evil Henry Wilcox. It was all about Wilcox and his shady, manipulative ways. Annie and Augie had broken up, Augie's once dead wife had reappeared, only to be killed for real by Wilcox. Then there was Annie's new boss Calder Michaels, who at first was hostile to her presence, then later was brought on board and started working with her. Then there was Arthur and Joan Campbell... oh they've been through a lot. Arthur was on trial for treason, in association with his now dead son. Joan was pregnant, demoted to a service desk in some basement office. Oh, and Arthur's lawyer was on WIlcox's payroll. Then as if that wasn't bad enough, Wilcox tried to have them both later killed when they discovered the duplicity of their lawyer. It all came down to snagging Wilcox's money man, his go-between man in Hong Kong. And Annie, Augie, and Calder went there to snag him. Up until this point in time, Wilcox had thought he had already killed off Annie. But when in Hong Kong, it got ugly, and finally, WIlcox discovered that Annie was not dead. But he captures Annie and tried to turn her over to the Chinese spy network, she escapes and finds WIlcox, finally... FINALLY putting an end to that slippery little traitor. Henry WIlcox is dead, (long live Henry Wilcox!) and then we had to suffer more as we watched and worried about how Annie was going to get out of Hong Kong. I was fretting a huge cliff-hanger. But instead, we had a proper closure for the season. Over the last few seasons Henry Wilcox has been a thorn in everyone's side, and from the looks of things, he's been under their skin and his evil ways under their radar for quite some time. WIlcox is played by Gregory Itzin, was quite the insidious and slippery bad guy who had the insight and resources to pull off most of what he wanted, from assisinations to financial or intel manipulation. Itzin always pulls off wonderful insidious bad guys. I hate him, and that's a credit to his ability. This fourth season of Covert Affairs was a wonderful change up from the formula outline stories from the first three seasons of Covert Affairs. It was a change up that had you wondering and worried for Annie. She had no real official support while sticking her neck out there, dark or rogue, on her own. MOst of the characters were pulled out of their comfort zones, and adding Calder to the mix as the new, stern boss, truly mixed it up. I found season four refreshing. From the first season, watching Annie Walker learn to the spy trade, to this fourth season, the rogue and dangerous spy, it's been quite the journey we've followed. So the story continues in its fifth season but I'm not sure where they'll go from here. They've done good so far. They being series creators and writers Matt Corman and Chris Ord.